NSW Department of Primary Industries has issued a Control Order prohibiting the entry of all citrus from the Northern Territory (PDF, 364.8 KB) including plants, fruit and leaves. The Order is effective from 24 April 2018 for three years (unless revoked prior). The Order is a precautionary measure, made in response to very strong evidence that citrus canker has been detected in Northern Territory and Western Australia. 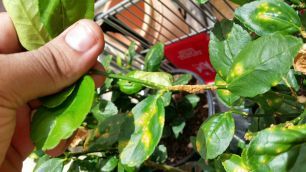 Citrus canker is a plant disease caused by the bacterium Xanthomonas citri sub species citri. Citrus leaves, stems and fruit are affected. It does not harm people. The disease presents as lesions or cankers at infection sites and severely impacts fruit quality and yield. Citrus is one of the most important horticultural industries in NSW with a production area of around 13,000 hectares. The Australian citrus industry is the largest fresh fruit exporter in Australia worth in excess of A$200 million annually. NSW produces around 250,000 tonnes of citrus annually representing 40% of Australian production and 36% of citrus exports. The largest and most important production areas in NSW are in the Riverina and Murray Valley regions, with smaller plantings located around Bourke, Narromine and the Central and North coast regions of NSW. The main citrus fruits grown in NSW are navel and Valencia oranges, mandarins, lemons, limes and grapefruit. Citrus canker is not present in NSW. Early detection, reporting and not moving suspect plants is vital. Signs of infection can look similar to other citrus diseases present in Australia. All suspected cases should be reported. If you think you have a plant with citrus canker, please contact the Exotic Plant Pest Hotline on 1800 084 881. Interstate travellers also have a role in preventing the introduction and spread of pests and diseases. Do not bring fruit, whole plants or plant cuttings from another state or territory into NSW without checking first. You can do this on the Interstate Quarantine website.